So again, this is a flavored corn-based liquor that is distilled to 190 proof, flavored, and watered down. The unique thing, however, is it is made using the TerrePURE method of distilling, which from what I can gather, is basically witchcraft and magic and unicorns thrown into an immersion blender. Okay, not really, but that's what it seems like at first. Actually the TerrePURE technology has to do with taking a distilled spirit and applying ultrasonic energy and oxygen to remove some of the byproducts of the fermentation process such as the funky esthers and non-ethanol alcohols that cause off flavors and increase odds of getting a hangover (aside from simple dehydration, of course). So basically, this makes a more "pure" spirit. 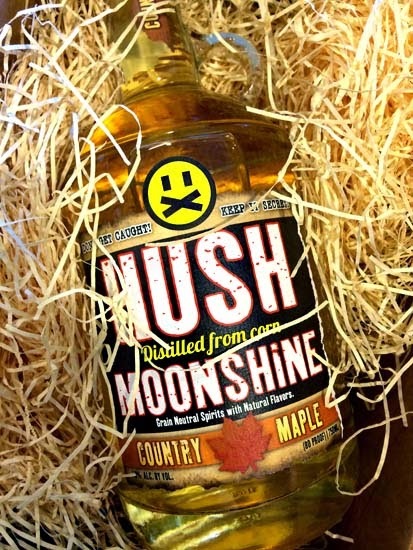 The Country Maple Hush Moonshine smells like light maple with a hint of butterscotch. Tasting brings the gentle flavors of light Grade A Maple Syrup followed by a blast of corn liquory sweetness, finishing with a distinct "moonshine" corn whiskey-like finish. 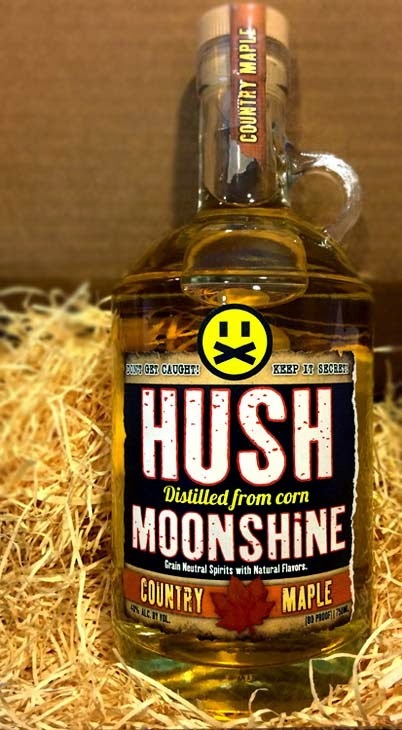 If you've tried several brands of corn whiskey, corn liquor, or moonshines, you'll know the flavor I'm talking about. All in all, Country Maple Hush Moonshine is pretty dang delicious and drinkable. Really, really tasty on the rocks. I genuinely prefer this to Jack Daniels Tennessee Honey. Again, like with the Spiced Apple Hush Moonshine, well above average for a flavored moonshine. This does evoke images of Fall, flannel, and sitting by the campfire. Considering the current time of year, count me in! Drink This: if you'd like a maple-flavored moonshine that tastes like real maple, without becoming cloyingly sweet. It's perfect for the Fall and slowly cooling weather. Drink it on ice. Don't Drink This: if you're looking for either a super SWEET flavored liquor or completely dry flavored liquor. This is sweet, but not overly so, yet that's why I could see some people wanting their moonshine on either end of the spectrum (sweeter or not at all).